Propak Philippinesthe first-of-its-kind food, drink, and pharmaceutical processing and packaging focused trade exhibition in the country opens at the World Trade Center Metro Manila in Pasay City on Thursday, Jan. 26, bringing in 292 leading companies from 29 countries, 9 international pavilions from China, Denmark, Germany, Italy, Korea, Singapore, Taiwan, Thailand and the UK together with a full programme of industry seminars. The three-day business convention comes at a time of huge economic growth and exports in the country and emphasizes the need for business owners in the country to adopt innovative packaging and processing solutions. Opening the convention is Sen. Aquilino “Koko” Pimentel III, Senate Chairman for the Senate Committee on Trade, Commerce and Entrepreneurship, and Department of Trade and Industry (DTI) Undersecretary Zenaida Cuison Maglaya. "We are launching ProPak Philippines to a backdrop of a very strong industry and strong government objectives and initiatives to drive it forward. We are very pleased that we have all of this strong support to support this first step into the Philippine market,” states Justin Pau, general manager of UBM Asia (Thailand) and project head of ProPak Philippines. 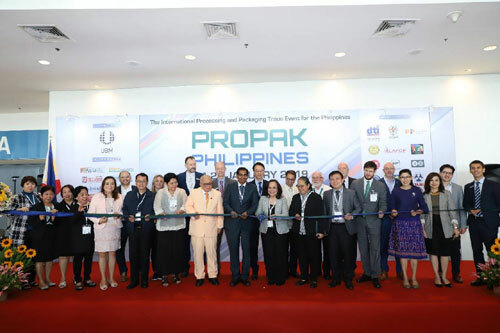 According to Department of Trade and Industry (DTI) Secretary Ramon Lopez, new manufacturing and packaging technologies will enable micro, small, and medium businesses (MSMEs) to grow and be globally competitive; established corporations, on the other hand, will also benefit from the exposure at ProPak. “In MSME development, the key is to make entrepreneurs smarter by exposing them to all new developments via networks like ProPak to solve the problem of minimum order quantity (MOQ) that has been really hampering the MSMEs and prompting them to upgrade their packaging requirements,” says Lopez. To Department of Science and Technology Secretary Fortunato dela Pena, packaging research and development is critical to extending the reach of products, especially that of MSMEs. “Propak Philippinesis very timely and relevant to the growing packaging requirements of the local industries, especially the MSMEs. The packaging exhibition will open opportunities for MSMEs to learn new trends and the latest technologies from across the world,” the DOST Secretary said. Apart from the new technologies and countless business opportunities it has brought, ProPak Philippines also includes PackPinas —a series of sessions led by experts in the field and will cover various topics, from food safety, standardization and business expansion, to packaging design and sustainable practices in packaging. On the topics of Quality Control and Food Safety, ProPak has four specialized seminars, namely: Mandatory Label Requirements for the Philippines and the World, Safety & Quality Requirements of Packed Food Products, FDA Requirements for the Processed Food and Non-Food Industries, and Safety Quality Requirements of Packed Food Products. On packaging design, innovations and technology, Propak has Packaging Technology & Innovations, Paper Packaging, Package Printing, and Packaging Design that Trends: How to Pack. For business expansion and export, Propak has five seminars, namely: Packaging for Business Expansion, Packaging for Business Expansion II, The Power of Digital Packaging Transformation, Value of Branding and Brand Identity, and Online Shopping: Disrupting Product Packaging. Lastly, ProPak also has seminars for sustainability and the environment, this includes Green & Eco-Friendly Packaging, Packaging Wastes and the Environment, and PET Recycling & Its Developments. Other seminars include the DTI / PIP Seminar, Food Safety Trends Philippines, the PAFT Seminar, and the PROMAP Technical Symposium. Apart from the main sessions, there will be topic-based talks led by experts throughout the three-day B2B event. For more details please contact Ms. Danah Castillo at +63 2 581 1921 or through email at [email protected].